This article is about Hermopolis Magna. For other cities called Hermopolis, see Hermopolis (disambiguation). Hermopolis (Ancient Greek: Ἑρμοῦ πόλις Hermoû pólis "the City of Hermes", also Hermopolis Magna, Ἑρμοῦ πόλις μεγάλη Hermoû pólis megálẽ, Ancient Egyptian: ḫmnw χaˈmaːnaw, Egyptological pronunciation: "Khemenu", Coptic: Ϣⲙⲟⲩⲛ Shmun) was a major city in antiquity, located near the boundary between Lower and Upper Egypt. 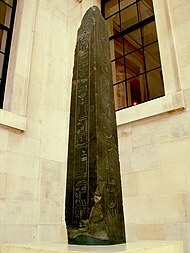 Black siltstone obelisk of King Nectanebo II. According to the vertical inscriptions he set up this obelisk at the doorway of the sanctuary of Thoth, the Thrice-Great, Lord of Hermopolis. It is now on display in the British Museum, London. A provincial capital since the Old Kingdom of Egypt, Hermopolis developed into a major city of Roman Egypt, and an early Christian center from the third century. It was abandoned after the Muslim conquest but was restored as both a Latin Catholic (meanwhile suppressed) and a Coptic Orthodox titular see. Its remains are located near the modern town of el Ashmunein (from the Coptic name) in Mallawi, Minya Governorate, Egypt. Khemenu (Ḫmnw), the Egyptian language name of the city, means "Eight-Town", after the Ogdoad, a group of eight "primordial" deities whose cult was situated there. The name survived as Coptic Ϣⲙⲟⲩⲛ Shmun, from which the modern name el Ashmunein (Arabic: الأشمونين‎) is derived. In Koine Greek, the city was called "The City of Hermes" since the Greeks identified Hermes with Thoth, because the city was the main cult centre of Thoth, the Pharaonic god of magic, healing, and wisdom and the patron of scribes. Thoth was associated in the same way with the Phoenician deity Eshmun. Inscriptions at the temple call the god "The Lord of Eshmun". Objects from the tomb of Djehutynakht, a nomarch during the Middle Kingdom era of Egypt. The city was the capital of the Hare nome (the fifteenth nome of Upper Egypt) in the Heptanomis. Hermopolis stood on the borders of Upper and Lower Egypt, and, for many ages, the Thebaid or upper country extended much further to the north than in more recent periods. As the border town, Hermopolis was a place of great resort and opulence, ranking second to Thebes alone. A little to south of the city was the castle of Hermopolis, at which point rivercraft from the Thebaid paid tolls (Ἑρμοπολιτάνη φυλακή, the Bahr Yussef in Arabic). The grottos of Beni Hasan, near Antinopolis on the opposite bank of the Nile, were the common cemeteries of the Hermopolitans because although the river divided the city from its necropolis, from the wide curve of the western hills at this point, it was easier to ferry the dead over the water than to transport them by land to the hills. Hermopolis became a significant city in the Roman province of Thebais Prima in the administrative diocese of Egypt. The principal pagan deities worshipped at Hermopolis were Typhon (Set) and Thoth. Typhon was represented by a hippopotamus, on which sat a hawk fighting with a serpent. Thoth, whom the ancient Greeks associated with Hermes because they were both gods of magic and writing, was represented by the ibis. A Christian tradition holds it to be the place where the Holy Family found refuge during its exile in Egypt. 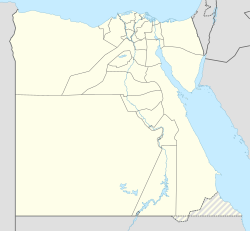 Hermopolis Maior was a suffragan diocese of the provincial capital's Metropolitan Archdiocese of Antinoe, in the sway of the Patriarchate of Alexandria. Like most, it faded under Islam. The city was a titular diocese in the Roman Catholic Church, and still is (?) in the Coptic Orthodox Church. The diocese was nominally restored in the 18th century as Latin Titular bishopric of Hermopolis Maior (Latin; 1925-1929 renamed Hermopolis Magna) / Ermopoli Maggiore (Curiate Italian) Its territory was reassigned in 1849 to the Coptic Catholic Eparchy of Mina, as a restoration of Hermopolis (as its Latin title attests). Francesco Fulgenzio Lazzati, O.F.M. (born Italy) (1931.07.14 – 1932.05.24) as Apostolic Vicar of Mogadishu (then Italian Somalia) (1931.07.14 – 1932.05.24). Hermopolis comparatively escaped the frequent wars which, in the decline both of the Pharaonic and Roman eras, devastated the Heptanomis; but, on the other hand, its structures have undergone severe changes under its Muslim rulers, who have burned its stones for lime or carried them away for building materials. A surviving Oxyrhynchus Papyrus of the 3rd century AD indicates that high-rise buildings with seven stories existed in the town. The collection of Arabic papyri in the John Rylands Library, Manchester, contains many documents referring to Hermopolis (Ushmun); they date from the 2nd to 4th centuries AH. The Ibis-headed god Thoth was, with his accompanying emblems, the Ibis and the Cynocephalus monkey, the most conspicuous among the sculptures upon the great portico of the temple of Hermopolis. His designation in inscriptions was "The Lord of Eshmoon". This portico was a work of the Pharaonic era, but the erections of the Ptolemies at Hermopolis were on a scale of great extent and magnificence and, although raised by Greek monarchs, are essentially Egyptian in their conception and execution. The portico, the only remnant of the temple, consists of a double row of pillars, six in each row. The architraves are formed of five stones; each passes from the centre of one pillar to that of the next, according to a well-known usage with Egyptian builders. The intercolumnation of the centre pillars is wider than that of the others; and the stone over the centre is twenty-five feet and six inches long. These columns were painted yellow, red and blue in alternate bands. There is also a peculiarity in the pillars of the Hermopolitan portico peculiar to themselves, or at least discovered only again in the temple of Gournou. (Dénon, L'Egypte, plate 41.) Instead of being formed of large masses placed horizontally above each other, they are composed of irregular pieces, so artfully adjusted that it is difficult to detect the lines of junction. The bases of these columns represent the lower leaves of the lotus; next come a number of concentric rings, like the hoops of a cask; and above these the pillars appear like bunches of reeds held together by horizontal bonds. Including the capital, each column is about 40 feet high; the greatest circumference is about 28½ feet, about five feet from the ground, for they diminish in thickness both towards the base and towards the capital. The widest part of the intercolumnation is 17 feet; the other pillars are 13 feet apart. Currently there is a small open-air museum in which stand two massive statues of Thoth as a baboon worshipping the sun, and a few carved blocks of masonry. ^ a b G. Mussies in: Matthieu Sybrand Huibert, Gerard Heerma van Voss (eds. ), Studies in Egyptian Religion: Dedicated to Professor Jan Zandee (1982), p. 92. ^ Strabo xvii. p. 813; Ptol. loc. cit. ^ Plut. Is. et Osir, p. 371, D.
^ Herbermann, Charles, ed. (1913). "Hermopolis Magna". Catholic Encyclopedia. New York: Robert Appleton Company. ^ "St. David of Hermopolis in Egypt - Orthodox Church in America". Oca.org. Retrieved 2017-03-19. Wikimedia Commons has media related to Hermopolis Magna.